Houzz 248 of our visitors have told a friend about this plan. 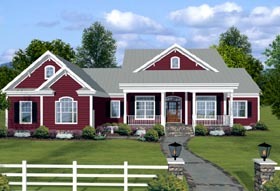 Welcome home to this delightful country "ranch" offering both beauty and an array of superb features. Boasting 2,294 square feet, this carefully designed home includes a country kitchen, relaxing screened porch, spacious family room, a luxurious master suite and two spacious secondary bedroom suites. An enormous future 1,562 sq. ft. bonus area offers unlimited possibilities. This unusually versatile home plan features surprises such as a library and an enormous family room with a fireplace! The country kitchen is a chef’s delight! Here a center island with a cook top makes meal prep a breeze. The spacious 22’6” x 15’2” family room is ideal for entertaining. An isolated luxurious master suite features a sitting area, his and hers walk-in closets and a spa-like bathroom with a garden tub and separate shower. Both of the secondary bedrooms are suites with walk-in closets and private bathrooms. Completing this level are a dining room with a tray ceiling, as well as a laundry room, freezer nook, powder room and a walk-in pantry in the kitchen. Choosing to finish the 1,562 sq. ft. bonus opens up a whole new world! Three additional bedrooms await you on this upper level. A centrally located computer center is ideal for homework and surfing the net. Tucked between bedrooms 4 and 6 is a quaint sitting area perfect for settling in with a good book. Rounding out this floor are dual bathrooms with a shared tub. This house plan was designed to match Garage Plan 74803 which is a stand alone 2 car garage with upper level living quarters. Question: What size are the garage doors? Question: When 8 sets of a plan are ordered, what size(s) are the prints? (24x36?) and how many pages in each one of the 8 sets? Question: My husband and I would like to view this plan with a daylight basement. What do we need to do to be able to see how the plan would look like? We need to see the actual layout of the basement. We are going to be building soon and we love this plan. I wish there was some real pictures of this plan. I was wondering if the basement would be like plan number 93483 I thought the plans favor a lot. Thank you! Answer: The basement option for this design is a fully underground basement vs. a daylight or walkout. The basement is also unfinished. 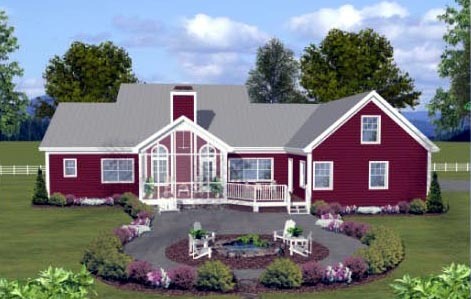 Question: My husband and I are thinking about buying this house plan we've had it saved for several years. Do you have any pictures of it built or a virtual tour? Answer: I regret that there are no pictures available for this design. Question: Is the front porch part of the foundation? Is the screened porch part part of the foundation or part of the raised deck? What is the "mech"closet on the main floor intended for? Do the plans include a "plumbing ground"?? Answer: Front porch is on a foundation and part of the house foundation. Rear porch is constructed with decking and part of the deck. Mech closet is the mechanical closet – used for air handler or water heater. Plumbing plans are not part of the plan set. Question: I noticed two circles in the family room, one on both sides of the fan. I was wondering what this was... thank you! Answer: Those are circles with an arrow that state VLT – abbreviation for a vaulted ceiling. Question: Do you have a floor plan showing a daylight basement? Where the stairs are and windows located in basement? Answer: Fully underground basement is all that’s available. Walkout or daylight will require custom modifications. Stair location though for the standard basement is located under the stairs leading to the bonus level. Freezer in the hall is removed and the entrance to the stairs starts there. Question: Does a plan for this exist that does not have the upstairs option? Answer: All variations have a bonus level of some kind. Question: What is the garage ridge height and dining/living rm ridge height for plan 74834? Question: Could you tell me the number of pages that are in this set of plans with a basement foundation? Question: Would it be possible for me to see the floor plan with a basement foundation? I would like to see any changes the basement causes to the first floor. Example: the mechanical closet and coat closet. Answer: Mech closet simply becomes a storage closet. The frzr is removed and the entrance to the basement stairs is placed there. Stairs go down under the current stairs leading to the upper level. Storage closet in the laundry is also removed. Question: Can you leave the bonus area as open space free of walls? Answer: There are support posts in the walls shown. The walls can be removed. However, not the posts. Question: Is there a model home built of this plan where I could see the finished project? If not, do you have any inside pictures of a completed home using this plan? Answer: We do not track building site and construction statuses. And I regret that we have no interior pictures available for marketing. Question: Where is the staircase located when purchasing basement plan? And how much sq footage does the staircase add to the foot print? Answer: Stairs are accessible from the laundry room and go down under the current stairs leading tot eh bonus level. Question: What is the house height at it's highest point? Answer: Ridge height is 25ft. from the main floor elevation. The national cost to build average does not include the land, septic or water. It is for the house only. Question: What is the total square footage under roof including the garage? Answer: Total under roof is 4921 sq.ft. – main level, bonus level, porches, and garage. Question: Hi what is the total square footage when everything is complete ? Answer: Main floor is 2294 and bonus is 1562. Total would be 3856 sq.ft. Question: Plan #74834 shows a dormer in BR above garage, but the elevations do not indicate one. Other similar plans (93483, 74854, 92443) do not show a dormer. Is there a dormer? Answer: There is a dormer for this design. It is simply not seen at the angle the 3-D digital renderings were created at. Question: Is the computer center open to the family room below? Answer: Ceiling height in the family room is not high enough to have that option. Subsequently, the computer center is not open to below. Question: Would it be possible to NOT have a wall between the country kitchen and the family room or do you need that for support? Answer: Wall is a support wall. So if the wall is removed an engineer will need to size a beam to replace it. It is also worth noting that there a posts in the wall as well. These posts are located under point loads above. Question: Is there any pictures of this house already built yet? Answer: Fairly new design so I regret that no photos from completed projects from our clients on file yet. Answer: To include the garage, front porch, rear porch, and deck into the main level area, the total will be 3,577 sq.ft. Add that with the upper level living area, the total will be 5,139 sq.ft. Question: What are the sizes of the 4 bathrooms? Question: With adding the basement plan, where would those stairs be located? Answer: Storage closet in the laundry is removed and a door is placed there for the stairs to go down under the stairs leading to the bonus level. Answer: No photos of actual builds on file for this design yet. Answer: Items in question are not included in the plans. Question: What's the totally sq foot under roof for plan 74834? Question: Do you have any views/pictures on any interior rooms? Or are their any photos from anyone that has used this plan to build? Answer: I regret that there are no further images or photos on record for this design. Click Here to download a free PDF Brouchure of Plan Number 74834.